Here's an original way to show your straightforward sense of style on every envelope you stick in the mailbox. These return address labels feature the robust look of burlap material in an attractive shade of earthy green. It's a minimalistic design that will also minimize the time you spend on a typically tedious task. Forget about scribbling out your name and address on all those letters and packages. These labels are self-adhesive, so now all you'll need to do is peel and place when preparing your outgoing mail. 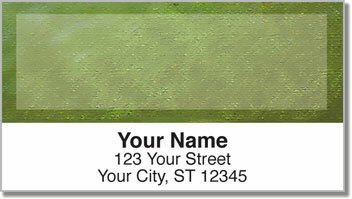 Make Green Burlap Address Labels yours today. CheckAdvantage also offers choices in a variety of colors as well as matching personal check designs.